Has anyone, lately, glanced up from their smartphones for long enough to notice how fast our planet appears to be going to hell in a handcart? My fringe-dwelling friends are responding in various ways. One chooses to boycott the news, while others research conspiracies (flat earth, reptilian Satanists, the trap of rebirth) or use astrology to modulate incoming signals. Meanwhile, I seek to stay creative, and other artists provide inspiration. So stories and images from their books and films sometimes haunt me. But with recent trends towards ‘realism’ in fiction and CGI in film (literature lacking magic, sensationalist cinema), only radical departures from the mainstream hold my interest. Speaking of which, though I’d seen just one of Antero Alli’s indie films (at a screening on the US west coast where he’s based), two decades later I recalled how The Oracle (1993) had transported me in a way reminiscent of dreams and altered states. 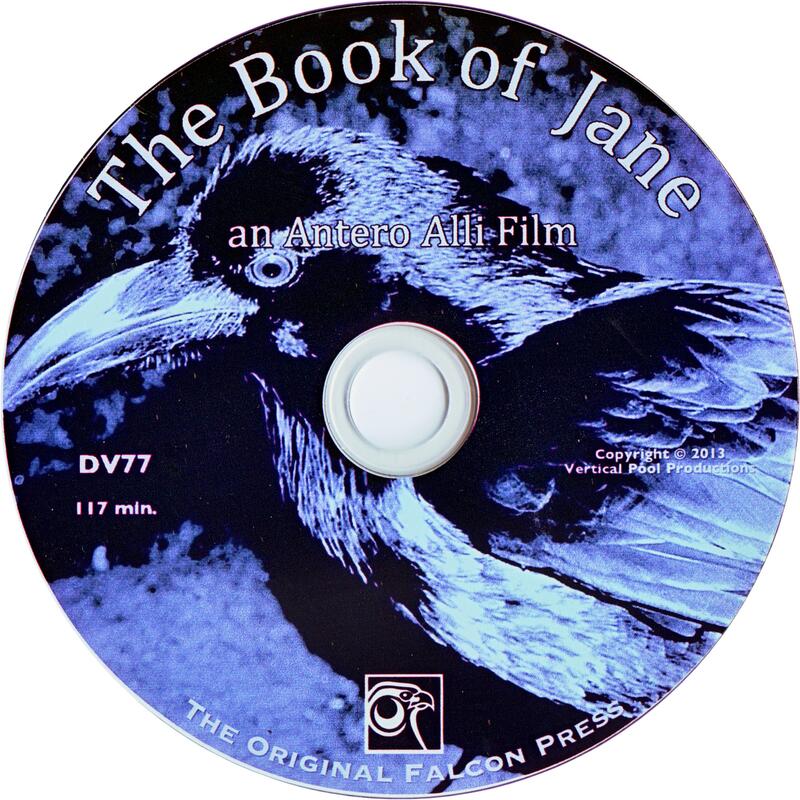 So I watched four more of his visionary films on DVD: Under a Shipwrecked Moon (2003), The Greater Circulation (2005), The Invisible Forest (2008) and, finally, The Book of Jane (2013), which lingered in my mind, so I’ve watched it again. After the vertical opening take – blue sky, ghost ravens, coastal skyline, suburban sprawl, university campus – a calm voice accompanies the limp of an ageing female vagrant. Not a typical voiceover telling us where she’s been or is going; Jane (Luna Olcott) dwells in the present, not the past or the future, unlike the first character to cross her path: Alice (Marianne Shine). From that name, we can guess Alice is destined to fall down a rabbit hole. The film’s title implicates Jane as a writer, yet Alice never suspects as much when they meet by chance on a bench in the grounds of the campus where she lectures. Aptly divided into chapters – Book suggests an alternative gospel (in polemical terms, matriarchal or feminist) – Jane deals with transformation. But its subtext feels mythic, not biblical. Scriptures are prescriptive, proscriptive. Myths incite imagination. Middle-aged (menopausal?) Alice, a comparative religion professor writing on pre-Hellenic goddess mythologies, lives with her cute younger lover, Colette (Madeline H. D. Brown), a painter of the sacred feminine. And we get some overtly feminist dialogue when these two women (whose bourgeois niceties and hippie-boho ideals coexist without irony) invite Jane (who typically dines on pickings from dumpsters) to dinner. Yet I doubt anyone could take Alli’s project for social realism. Early scenes showing Jane’s idyllic lifestyle around the campus befit a fable, not a documentary. Unless sleeping rough holds less risk in Berkeley than in Sydney? Though if sane, sober, hyper-educated, Anglo women don’t live under bridges here, maybe we can thank Australia’s superior social safety net? Or does Alli (despite the side effects of Jane’s pain meds) romanticise homelessness? According to his director’s notes, which touch on his process of finding the story: ‘shocks and traumas can sometimes act as evolutionary triggers that transform our lives for the better, even though by outward appearances it may seem otherwise’. Indeed. No wonder Jane, which I’ve now watched three times, continues to haunt me. Though I’ve suffered no comparable losses, nor ever stayed homeless (‘nomadic’) for long, I’m no less redundant in the context of a consumer culture, while with growing global rivalry over resources, the spectre of homelessness threatens more and more of us. And due to an unforeseen plot twist, it catches up with Alice. Ergo, Jane’s prediction – ‘I am you in the future’ – comes true. Which implies Jane was Alice in the past, though I saw no credible evidence. Shown Alice’s work in progress, she merely grabs a red pen and circles the word is wherever it appears… Has agnostic mystic author Robert Anton Wilson hijacked the script? Not that his astute critique of the misuse of ‘is’ was unique; surrealist painter Rene Magritte made a similar point with visual wit in The Treachery of Images (This is not a Pipe) . Yet Alice seems so receptive to Jane’s wisdom that I felt sceptical. Which isn’t to say such quirks in the script can eclipse Jane’s (or the director’s) intelligence. Ageing, anonymous, solitary and shorn like a monk, Jane appears to find all she needs (apart from opiates for her pain) in the trash that others (like Alice) reject and the subtle realms they can’t sense. Yet I could also relate to the challenge facing Alice (though ‘higher’ education has always left me disenchanted). Immersed in theories about the practice of goddess worship, she enacts a key contradiction of our age: gesturing towards soulful/spiritual knowing in a culture based on disembodied/displaced information (the transmission of which earns her a living). Though Alli’s notes don’t refer to this theme, it emerges as key when the two comparatively sheltered women must contend with a sudden death, and find the rituals of the law inimical to their instincts. Yet all of Alli’s films that I’ve seen, while exploring archetypal depths, and despite the relevance of their themes to contemporary society, seem – at least on the surface – to exist in a time warp. The ones I’ve missed may well engage with definitively modern problems and document a world increasingly subject to technology – but that would take money. To what extent is Alli’s aesthetic subject to his budget? And yet what can seem like constraints on, for one, special effects don’t extend to the stylistic range of the at times sublime soundtrack. It’s as if Alli doesn’t want to commit to a genre. Why not? In the vision statement on his website, he says: ‘I don’t call myself an artist. Best to let others, the world, decide what to call you.’ But isn’t film an art form? It can also impart propaganda; these roles aren’t mutually exclusive. And isn’t art in some sense always a messenger (of change, doom, love, renewal etc.)? Artists need to remain responsive to the demands of their art form, while trusting the alchemy of the work. Activists too must learn to surrender, albeit to external realities. Yet, unlike even the most pressing message, art – i.e. as it manifested not just for centuries but millennia, before pomo theorists moved (or removed?) the goalposts – had a shot at relative immortality. It may be no accident, nor just due to historical distance, that great art strikes most of us, even critics, as enigmatic. Take any random sample of Alli’s influences: e.g. Cassavetes, Tarkovsky, Herzog, Lynch, von Trier… auteurs whose art transcends their personal beliefs. If the medium is just a means to an end, art suffers (instead of the artist?). Does The Book of Jane ever suffer artistically? Here and there (where Alli wears his ideology on his sleeve), I cringed at its seeming naivety. And today’s viewers, sated on state-of-the-art high-tech sophistication (and programmed by subliminal cues) expect seamless illusions. Yet the mostly stellar performances Alli elicits from his leads, the wildly talented Olcott and the luminous Shine, are as compelling as any star turns I’ve seen on film in a while. Between them, he’s assembled enough divine feminine energy that the succession of women, and/or their images, with wings sometimes struck me as too much of a good thing. Towards the end, Alice’s circumstances change for the worse – from the stance of her ego – due to a landlady we never see. So the lack of Asian actors in the film (an anachronism?) begs the question: why make this landlady Asian? Well, if nothing else, it points to her otherness. If the Goddess has a hand in the twist of Alice’s fate, this may be as close as She needs to come to showing Her face. As a cineaste engaged by the questions Alli raises, I may be alone in finding his symbolism overstated. That it appears to cater to a cult following of fellow mystics, Jungians, pagans, new agers etc. might explain why his aesthetic (unlike his state) hasn’t much altered in decades. Alli offers the world an alternative vision, not a mirror. Though maybe his fans recognise their own reflection in it – what member of a minority can’t use acknowledgement of their existence? So The Book of Jane ends on a liberating high – unless the prospect of seeing spirits and dancing to inner rhythms frightens you? I love participating in ritual theatre, where symbols, physical actions etc. serve to focus and ground ideas. But for me the experience doesn’t wholly translate to film – just as I can’t smell pipe tobacco if I sniff a print of Magritte’s The Treachery of Images. Still, the image might stimulate my brain to recall the aroma – and for those so inclined, the taste of pipe smoke. Words on a page, too, can evoke that. Yet each viewer or reader is unique. And so, isn’t a crucial part of any artist’s struggle gauging how much to leave to the imagination? This entry was posted in innovative cinema and tagged Antero Alli, archetypes, arthouse film, avant-garde film, experimental film, feminism, goddess worship, indie film, Luna Olcott, Marianne Shine, mysticism, otherness, The Book of Jane, the Morrigan, triple goddess, underground film, visionary film. Bookmark the permalink.